The garnet gemstone is the mordern, traditional and ayurvedic january birthstone, as well as the zodiac birthstone for aquarius and secondary birthstone of capricorn. On the other hand the mystical january birthstone is the emerald gemstone. The garnet gemstone is also the designated gemstone for the 2nd and 6th wedding anniversary. The garnet is a stone with an inner fire that defies even the coldest winter days. And the month of January is filled with those. January is named for Janus, the two faced Roman God of beginnings, endings, gates and doors. This is because January pays tribute to the year just past and harbingers the journeys we'll make into the New Year. The january birthstone garnet means faith, truth and consistency. The name garnet comes from the latin word garanatus, in reference to the pomegrante seeds. Its deep red color signifies eternal friendship and trust as well as loyalty and faithfullness. Garnet is a very abundant gemstone and can easily be found in many places around the world. What all varieties of garnet share is a common formation and cubic crystalline structure. Garnets are uniformly brilliant, natural, and durable. Garnets are also amongst the hardest gemstones, rating between a 7 and 7.5 on the Mohs Hardness Scale, and garnet beaded jewelry is generally affordable, making an ideal birthstone. If you thought that the group of garnet gems had only red to offer, you will be surprised to know that this is not true. Garnet gemstones come in many colors including red, orange, yellow, green, blue, purple, brown, black, pink and colorless with the blue garnet being the rarest of them all. The most common color of garnets is reddish brown, or deep brown red sometimes confused to a ruby. Basically the color of a garnet is divided into three components. Unusually colored garnets each have their own names. 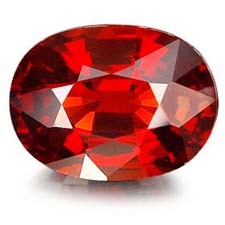 For example, reddish garnets with traces of brown are known as Pyrope, orangish reddish garnets are called Spessartine (pretty rare though), dark red wine color garnets are known as Almandine, emerald green garnets go by the name of Tsavorith, velvety red color garnets are called Rhodolite and the orange variety garnets are know as Hessonite. This is to name only a few. Psychic sensitivity and sexual energy are said to be increased by wearing garnet gemstones. The january birthstone garnet is believed to be a balance for ying and yang energies. The energy that comes out of a garnet is said to peaceful and balancing, promoting compassion and faith. Garnets are also said to aid night vision, ensures success, provides guidance, protection, purification, and warmth. The ancient Egyptians believed that garnets could purify the body of some toxins. It is also said to relieve rheumatism, depressions, stress and prevent nightmares. Those people under depression can put the garnet gemstone under their pillow to try to cure it. The garnet is also said to be beneficial to those with heart ailments or thyroid gland problems This stone is also widely used when meditating on past reincarnations. The majority of today's Garnet supplies come from the African countries. Garnets are also found in a wide variety of other locations such as India, Russia, Sri Lanka, Thailand, Burma, Brazil, Canada and USA.